CapTel 840i - Weitbrecht Communications, Inc. 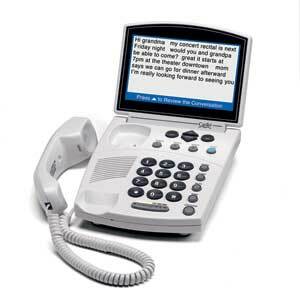 The CapTel 840i captioned telephone shows captions of everything said to you over the phone. It connects to both telephone service and high-speed Internet service to give you the best of both worlds: voice and captions. The captions are provided by a free service that uses the Internet connection to automatically display captions for every call, quickly and accurately. The CapTel 840i is an ideal choice for individuals who prefer the size and feel of a traditional home phone. NOTE: The CapTel 840i can be positioned anywhere within your wireless network range or it can be connected to your Internet with an Ethernet cable. Installation assistance is available. If you wish to connect an Ethernet cable and your Internet access is not located in the same room you intend to use the CapTel 840i phone, please call 800-233-9130 for assistance.